We will never be able to attribute to a single individual the development of the basic building blocks of writing. Yet we do know the name of the man who devised the method of classifying the basic building blocks of matter: Dmitri Ivanovich Mendeleev. Born in Siberia in 1834, he was first trained as a teacher in the Pedagogic Institute of St. Petersburg before earning an advanced degree in chemistry in 1856. Shortly after this success he became a professor of general chemistry at the University of St. Petersburg. There he was unable to find an appropriate textbook for his students and thus began writing his own. That textbook, written between 1868 and 1870, would provide a framework for modern chemical and physical theory. Mendeleev’s periodic table, a rectangle of colourful framed squares hanging on the walls of all chemistry departments in the world, is considered the "Gospel" of the chemist or, better, its portable version. Nowadays the periodic table is printed everywhere, from calendars to mouse-pads and bookmarks. We can say that it represents the essential order of matter according to human rationality. My guess is that even aliens from outer space would recognise its beauty and fundamental logic. The picture on the right shows Mendeleev’s first sketch of the periodic table of the elements. A combination of 26 letters make up every word in the English language. Similarly, all material things in the world are composed of different combinations of about 100 different elements. An element is a substance that cannot be broken down into simpler substances through ordinary chemistry - it is not destroyed by acids nor changed by electricity, light, or heat. Although philosophers in the ancient world had a rudimentary concept of elements, they were incorrect in identifying water, for example, as one. Today it is common knowledge that water is a compound, whose smallest unit is a molecule. Passing electricity through a molecule of water can separate it into two atoms of hydrogen and one atom of oxygen, each a separate element. The ancient concept of elements jibed with today's in noting that elements had characteristic properties. Just as people not only look different from each other but also interact differently with others, so elements have both physical and chemical properties. Some elements form shiny solids that react readily and sometimes violently with oxygen and water - iron, which is labeled ferrum in the periodic table, literally burns in such an atmosphere for example. The atoms of other elements form gases that scarcely interact with other elements - the inert gases. The first modern scientist who attempted to give an order to matter as we know it was the French chemist Antoine Lavoisier just at the dawn of the French Revolution in 1789. He published a list of 33 chemical elements, selected as gas, metals, non-metals and earth. Other chemists tried in the following 19th century to give other classifications. The German chemist Johann Wolfgang Doebereiner made a table of the elements in groups of three (for instance lithium, sodium and potassium are all soft, so: all together) while the English chemist John Newlands in 1865 classified the elements according to their increasing atomic weight and similar chemical physical properties. He found that repetitions occurred every eight elements like notes in a musical scale. In 1869 German chemist Julius Lothar Meyer and Mendeleev published their classifications independently. Both listed the elements according to their increasing atomic weight and started a new column whenever the chemical and physical characteristics of an element appeared to be similar to a previous one. The most famous table became Mendeleev’s one, not just because he published it first, but because he did two things that nobody had considered: first, he left gaps in the table corresponding to an element that he predicted to exist but it was not yet discovered. Secondly he privileged chemical-physical properties, ignoring the order suggested by the atomic weights. In this way he classified cobalt and nickel in a more appropriate way than his European "colleagues". The table on the left is a reprint of Mendeleev’s table as published in 1869. It has still many gaps and uncertainties. The table was rotated later on for clarity and remained as such until today. Other elements were added of course as soon as they were discovered. The table below is a reprint from 1898 for example (W. Ostwald, Grundriss der Allgemeine Chemie) - Marie Curie discovered Radium in this very year. Its place should be in column II below Barium (Ba). However, this table was out of date as soon as it was published. Scientists had identified over 60 elements by Mendeleev's time - today over 110 elements are known - and the table of elements has improved ever since. 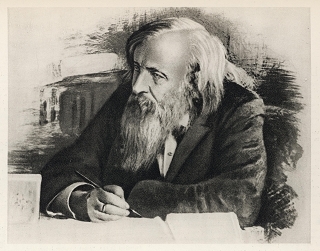 In Mendeleev's day the atom was considered to be the most basic particle of matter. The building blocks of atoms (electrons, protons, and neutrons) were discovered only later. What Mendeleev and chemists of his time could determine, however, was the atomic weight of each element: how heavy its atoms were in comparison to an atom of hydrogen, the lightest element. An overall understanding of how the elements are related to each other and why they exhibit their particular chemical and physical properties was slow in coming. Between 1868 and 1870, in the process of writing his book, The Principles of Chemistry, Mendeleev created a table or chart that listed the known elements according to increasing order of atomic weights. When he organized the table into horizontal rows, a pattern became apparent - but only if he left blanks in the table. If he did so, elements with similar chemical properties appeared at regular intervals - viz. periodically - in vertical columns on the table. Mendeleev was bold enough to suggest that new elements not yet discovered would be found to fill the blank places. He even went so far as to predict the properties of the missing elements. Although many scientists greeted Mendeleev's first table with skepticism, its predictive value soon became clear. The discovery of gallium in 1875, of scandium in 1879, and of germanium in 1886 supported the idea underlying Mendeleev's table. Each of the new elements displayed properties that accorded with those Mendeleev had predicted, based on his realisation that elements in the same column have similar chemical properties. The three new elements were respectively discovered by a French, a Scandinavian, and a German scientist, each of whom named the element in honor of his country or region. (Gallia is Latin for France.) Discovery of a new element had become a matter of national pride - the rare kind of science that people could read about in newspapers, and that even politicians would mention. This race continues until today. Claiming a new element now meant not only identifying its unique chemical properties, but finding the atom's atomic weight so the element could be fitted into the right slot in the periodic table. For radioactive atoms that was a tough challenge. At first these atoms were isolated only in microscopic quantities. The straightforward way to identify them was not by their chemical properties at all, but by their radiations. Until the radioactive atoms could be sorted out with traditional chemistry, some scientists were reluctant to call them new elements. What made the Table periodic? The value of the table gradually became clear, but not its meaning. Scientists soon recognized that the table's arrangement of elements in order of atomic weight was problematic. The atomic weight of the gas argon, which does not react readily with other elements, would place it in the same group as the chemically very active solids lithium and sodium. In 1913 British physicist Henry Moseley confirmed earlier suggestions that an element's chemical properties are only roughly related to its atomic weight (now known to be roughly equal to the number of protons plus neutrons in the nucleus). What really matters is the element's atomic number - the number of electrons its atom carries, which Moseley could measure with X-rays. Ever since, elements have been arranged on the periodic table according to their atomic numbers. The structure of the table reflects the particular arrangement of the electrons in each type of atom. Only with the development of quantum mechanics in the 1920s did scientists work out how the electrons arrange themselves to give the element its properties. Today we are looking at the Standard Model of particle physics with the same interest than the scientists in the 1870s at the Periodic Table of elements. The Standard Model is a quantum field theory devised to explain how subatomic particles interact with each other. It is effectively the union of quantum chromodynamics and the elecroweak theory. In the Standard Model, there are 16 fundamental particles – 12 particles of matter and 4 force carrier particles. An additional particle, known as the Higgs boson, must also be included to explain why the other 16 have mass. Particles acquire their mass, it is theorised, through interactions with an all-pervading field, called the Higgs field, which is carried by the Higgs boson. The Standard Model was developed in the late 1960s and early '70s and has stood up to numerous experimental tests. However, it is generally accepted among physicists that it cannot be a fundamental theory of nature since it does not embrace gravity and only makes sense if viewed as a low energy approximation.